Its kinda crazy how God has used my normal everyday errands to help me be more aware of the people around me, to slow me down and help me be more intentional with my faith on the local mission field. I have found that when you put your time, talent, and treasure in the One who desires your first fruits, He always redeems your time, grows your talent, and blesses your treasure! Today, I had to go to the north end of town to fill our water jugs and stop to grab some groceries for dinner that night. He has been reminding me lately to be content with planning for my daily bread and not tomorrow’s bread. Since Winn Dixie was on my way, I stopped in there and scoped out the parking lot, parking a little up front, getting a little bolder I guess. I glanced around at the 1/2 empty parking lot and then looked down at the index card, and then back up watching people go in and out of the automatic doors of the grocery store. I didn’t really sense a certain car He wanted me to leave it with today and since I never placed it on a car right next to me I decided today would be the day I did. 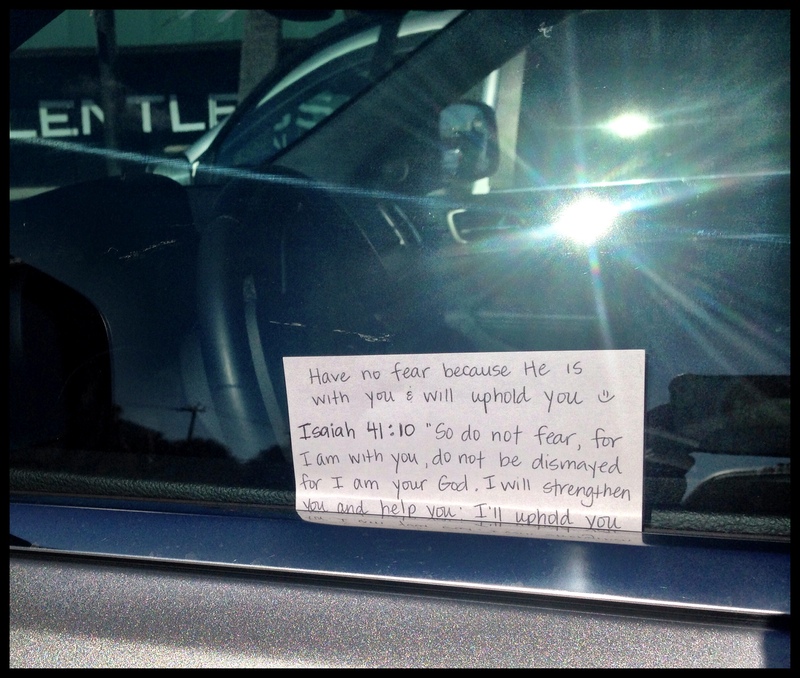 A grey grand Jeep Cherokee was parked to my left and so I hopped out of my van and left the index card in between the window of the drivers side. As I came around the Jeep, a man was putting his groceries in his car and stopped what he was doing and looked at me. I smiled and said “Good morning!” as I walked back to my van to get my things to begin shopping. He just looked inquisitive at me and continued his task without returning a comment.